My Grandpa died almost twenty years ago. I remember the date because it was the day after my 12th birthday. Most of my primary school classmates were away on a residential trip, but I’d chosen not to go (an introvert even then) and so there were just a few of us left. Later that week the headteacher – the perfectly named Mrs Spankie – came into the classroom, placed a gentle hand on my shoulder, and told me I’d won a national competition for my project on Robert Burns. I have never liked Robert Burns. It’s a bit ridiculous, but even after this long I can remember Grandpa’s phone number. I remember the year – 1995 – when all British numbers gained an extra digit and I always had to remind myself to tap a 1 after the 0. Goodness knows how many times I dialed that number, back in the days when you waited until the evening or weekend for cheaper calls. He lived in Staffordshire, and in the summer holidays we would always go down to visit. It required two flights – Stornoway to Manchester with a short stop in Glasgow – or an early morning ferry journey followed by a full two days of driving through Scotland and England, along the side of Loch Ness, through Inverness, down past Perth, through the Central Belt and the Borders and finally to the M6. There would be a stop off to pee and refuel at Southwaite services. And then onwards. Waving at all the lorry drivers, sucking boiled sweets and watching the signposts through Wigton, Penrith… napping as much as we could… if we were feeling indulgent we would stop at Tebay for Kendal Mint Cake. Then there was Barrow in Furness, Morecambe and Blackpool… I always got excited because that felt like we were getting to some theme parks at last… Preston, Southport, Chester, Warrington. When we started to see the signposts for Holmes Chapel and Sandbach, we were nearly there. We would take some slip road, zip through some congested town centres, full of those tightly built red brick buildings that the midlands are so good at. We would start looking for familiar pub signs – Red Lions and the like – and eventually we would be there. I often seemed to get in trouble at Grandpa’s. Once I bit the side out of a wine glass, and was urged to follow it up by swallowing cotton wool balls, soaked in milk. I got my hand stuck in a supermarket trolley, and had to be eased free. I stuck a button up my nose, necessitating a late night trip to the hospital. The family embarrassment at my spitting and hissing at Dr Carpenter – the family GP – still burns bright and raw. A year or two after the button incident – I have never told anyone this – I stuck a tiny round metal object up one nostril. I still don’t know what it was. It felt like a bullet. I panicked, pushed too hard and it disappeared. I fished around but it was gone. I was in my Mum’s bed that night, not my own. There was a patchwork blanket on top of me and some dried flowers on the dressing table. A year later exactly I was playing football in Grandpa’s garden with my brother. The longest, stringiest snot trail you have seen in your life came out of my nose, and attached to it was the metal pellet I had stuck up there twelve months earlier. I cried hard with relief, and held the thing up in triumph. My brother heaved and passed me a tissue. Next door, under the archway of the hedge, our Uncle’s goldfish kept swimming round in circles. Then I whacked a tennis ball right up on the roof. Once a week when I was down at Grandpa’s we would go round to my Aunty’s house. We would have Gino Ginelli Tutti Frutti ice cream, and we were surely the coolest kids in town. I used to browse the bookshelves of my clever older cousin, and we would watch middle-aged men lose their golf balls on the course that their house backed onto. Year after year when we went back to Grandpa’s it would be reassuringly similar – there would be grapes in a bowl in the dining room. If they were seedless I would eat the whole bunch the first day I was there. If they had seeds, I would try to crunch my way through one before spitting it out into the bin in disgust. He would play jazz on vinyl or cassette tape, on his mad old machine which took up half a wall. I would look in the fridge, which would be full of Grandpa’s favourites – lemon sole goujons and sirloin steak. Two or three cans of squirty cream, which he liked to swirl in great sugary peaks on top of his ice cream. Usually a Guinness or two. Despite the familiarity, Grandpa’s was a place for exploring too. He had often invested in some gadget or another. My first glimpse of a VHS player, a dishwasher, and a portable video camera were all at his house. The black and chrome of the new machines always felt incongruous beside the old Rayburn, where he would pop the orange he had for breakfast every morning to warm it. (Apparently it made the skin easier to peel.) The giant TV in the living room was where he watched motor racing. The old black and white TV with a knob that you had to twiddle to find each of the four channels was in the dining room, where we sat together and watched Carol Vorderman on Countdown. One year he had even bought a caravan! It never left the driveway, but it was the best childhood den ever. We would go to Tittesworth reservoir. To Buxton Micrarium. Or just to the park to feed the ducks. There was the Leek Carnival. There was a new drink called Vimto. There was a big new Safeways store on the other side of town, where they had mini trolleys for small people like me to push. I went shopping there with my Aunt and tried a kumquat for the first time. There was McDonalds in Hanley where we would go for a milkshake and chicken nuggets. We’d go to the Clarks shoes shop, and I’d have to step into that machine that closed in around your feet in a slightly scary way. I’d get a pair of new school shoes, a pair of slippers, and a pair of wellies. We’d go to the bookshop. I wish I could remember what it was called. And there was my favourite in Leek town centre – Partners, the stationery shop – I would plead with Grandpa to buy me stickers, folders and notepads, fluorescent erasers, brightly coloured post it notes, highlighters, bic ball pens in a dozen colours. Then we would go home, for a Grand Prix replay or the cricket. He liked Tom and Jerry cartoons and the Pink Panther. He liked jazz, and Puligny Montrachet. He lined up pennies and tuppences on his dressing table. He collected matchbooks, had hundreds of them from his time working, staying in hotels and restaurants all over the country. He went abroad once in his life, to Vienna. He had Toby Jugs, and brass scales. There was one cracked pane, in a window, in his house, which he had hit with a cricket ball as a boy. There was a cupboard, at the end of the corridor, at the top of the stairs, that we never talked about. It was something to do with the fire service, and the war, and every time I went to wee in the middle of the night I felt a little bit scared by it. When Grandpa tucked me in, I wanted his stories instead of bedtime stories. I didn’t really care what they were about. I would hug up to his wooly jumper, with suede patches on the elbows, and listen to the story about his hernia or his car journeys around Skye, or his fixing the tiles on the roof, or any other such thing. He would pull out one of his Scots magazines from the shelf, and show me some map or another. I was minded, I don’t know why, this week… to look up the address of his old house. It is not just a house, anymore. It is the home – the working home – of a holistic medicine practitioner. He would be outraged. Bloody hippies. But it is very appropriate. 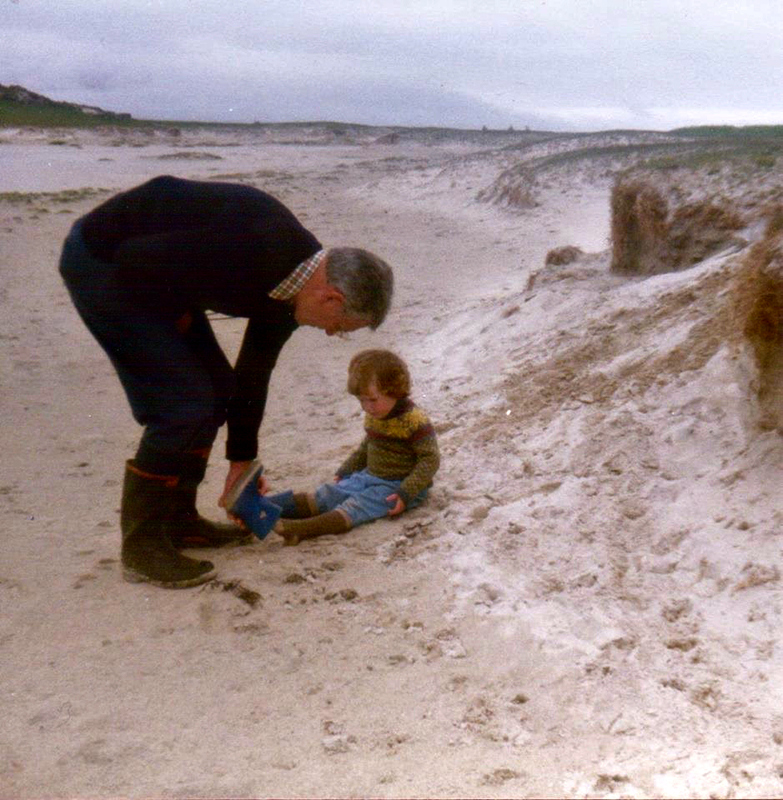 Every one of his descendants – the ones who live nearby, the ones who live counties and countries and continents away – we all still feel his hand on our shoulder. We all feel his love, and his hope and his disappointment. Every one of us needs to talk more openly and honestly than we do, sometimes. We need to move beyond that daft thing that so many families have of bottling the difficult stuff up inside. We are starting to. This family is more honest than it has ever been, and that is a good thing, I think. Why have I been mulling over all this? I don’t know. Perhaps it is because of DorkySon’s constant questions at the moment. He is five years old, and has a growing awareness that we are all mortal. He has been trying to put us all in context, asking about age, requesting stories about when I grew up, looking through old photos, understanding that there was an existence before him. So I have been thinking about the big stuff. But that has prompted me to remember the little stuff too, to try and pin down the little details that make a place what it is, or a person who they are. It feels important to remember. Nooo! I don’t remember that! What happened?! We were down in Leek for Christmas, you were probably 2 or 3. Great Uncle Frank had gifted a couple of jars of home pickled eggs, one of which didn’t have the lid screwed on properly and started to leak vinegar onto the rest of the presents under the tree. Grandpa made the mistake of uttering an exasperated ‘Bloody Hell’ within your earshot as he went to clean it all up. Lovely. A little bit teary. The car journeys back then seems so long. Grandad was the main man in my life as my dad left when I was young. Love your writing, and bloggers block comes to us all. Loads to write, but it gets stuck somewhere between brain and hand. Beautiful post, so evocative, although having forgotten it’s very existence for years, I now have the song from the Gino Ginelli advert in my head. Little details are definitely very important and what make us and our memories. What a lovely reminiscence. I never had any real grandparents, and I think I would like to adopt your grandfather. My Nana lived until I was in my 30s but she was far away and my family was not the close-knit type one reads about in stories like The Homecoming. I also love the photo of you two on the beach.